Heat oven to 400°F. Grease large cookie sheet. Unroll dough on cookie sheet. Press to 14x8-inch rectangle. Fold both long sides over about 1/2 inch to form rim, pressing to seal. Bake 8 minutes. Spread dough with pesto. 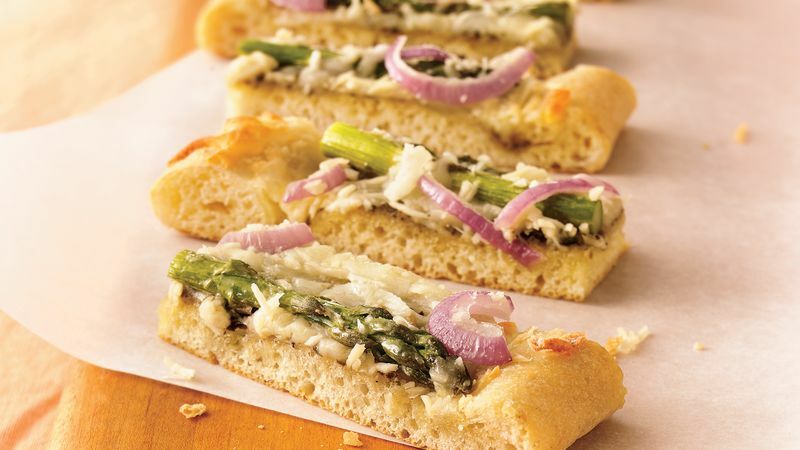 Arrange asparagus and onion on dough. Sprinkle with cheeses. Bake 8 to 10 minutes or until edges are golden brown and cheese is melted. Cut crosswise into 14 (1-inch) strips. Cut in half lengthwise to make 28 pieces. Serve warm or cool. Look for fresh asparagus that is bright green with firm, unopened tips. To trim, snap off the tough ends where they break naturally. If desired, use a vegetable peeler to remove the outer layer of the spears. Store unused pesto in the refrigerator. Use later for pastas, soups or sandwiches.